Please help the Round House pub get a Blue Plaque from the BBC. two weeks before his 32nd birthday. with recordings and live music from Simon Prager, Doc Stenson, Hylda Sims, John O'Leary and Laurie Garman. 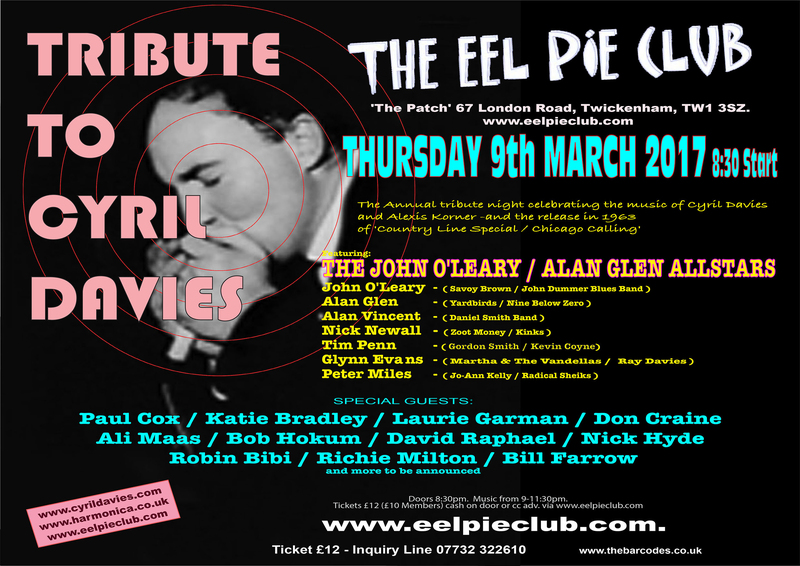 The annual Cyril Davies Tribute Night will be held at the Eel Pie Club in Twickenham at 8:30pm on 9th March 2017. Lots of guests plus the house band led by John O'Leary and Alan Glen. We are building a history of the life and times of Cyril Davies through the memories of many of the artists who appeared with him - Musicians' Recollections - and the many other people who remember seeing and hearing Cyril as they were growing up through these years - Guest Book. If you have anything you want to add please send your recollections to us for inclusion. Check the recent updates by musicians who played with Cyril. Todd's book about the life and times of Cyril Davies is nearly finished but we still we invite any interested parties (be it from friends, associates or just admirers) to get in touch with us. The site is divided up into sections on Cyril's Career, the Recollections of Musicians of the times, a Discography of Cyril's Recording, and a Section for the People who Documented the Times is being written. Links to these sections are provided at the bottom of this page. The Ealing Blues/Rock Club is active again and celebrating the great heritage of the club and the music which developed in the local area 50 years ago. Cyril and Alexis opened the first club and the Rolling Stones were amongst the many young musicians who cut their teeth there. www.ealing-club.com and www.facebook.com/ealingclub. A Blue Plaque commemorating 50 years since the first R&B nights at the Ealing Club was unveiled by Bobbie Korner outside the club on 17 March. Check out the videos of this and the fund raiser events. Here is the interview I did at the event about Cyril's musical history and contribution to the UK blues boom..
Another collection of tracks by Cyril Davies and Alexis Korner recorded in the years up to the end of 1962 has been released by Jasmine. The Cyril Davies All Stars recordings have been trapped by the recent increase in copyright restrictions which apply to recordings from 1963. Chris Barber has issued a double CD of unreleased tracks Memories of my Trip from his career starting back in the 1950s with tracks from the bluesmen he brought over and played with in the 1950s and 60s. The long promised Cyril Davies Memorial album Preachin' the Blues has just been released by Magpie and Amazon. It includes the All Star tracks, like Country Line Special, released on Pye just prior to his death. A limited edition of an EP of tracks from an All Stars radio session in 1963 is now on sale. Here is Cyril Davies and the All Stars playing on TV in 1963. We are also seeking information on the infamous 'London Blues & Barrelhouse Club', the intimate up-stairs venue found on the corner of Wardour and Brewer Streets in London's Soho. This venue is most commonly referred to as 'The Roundhouse or Round House' - which was actually the public house below the 'London Blues & Barrelhouse Club' on the street level. If you have any memories or photographs, please let us know! 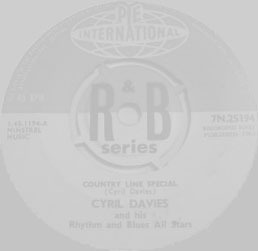 Sit back and listen to Cyril's and Britain's first blues harp hit, Country Line Special and Chicago Calling from 1963. 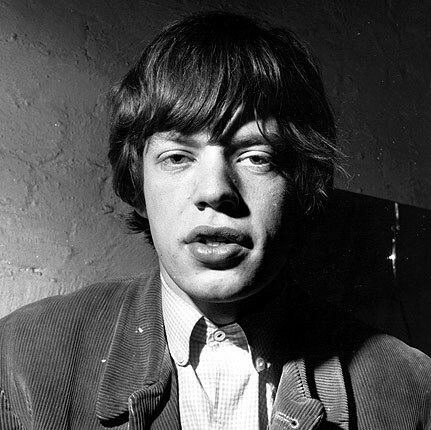 Watch Mick Jagger talking about learning from Cyril Davies. Recent uploads to YouTube have included another Hulabaloo clip, where Cyril and the All Stars playedSee See Rider, and the interview with Long John Baldry, which appeared as part of the?bonus track (Track 13)?on?the 1996 LJB album, Right to Sing the Blues.. There is also an interesting interview on Resonance 104, by Henry Scott-Irving of Cyril's sax player Art Themen which starts with his time with Blues Incorporated. Copyright Disclaimer: All the words, sounds and images on these pages are subject to copyright. Please obtain the permission of the copyright holder before using material copied from this site. If you are the copyright holder of material being used on this site and you would like it removed, get in touch and we'll remove it. If you would simply like us to add a credit to your work and a link to your own site we'd be delighted to oblige. It's only here in the first place because we admire it. Cyril Davies - British Blues Architect, is a not-for-profit enterprise. Its contents are online purely to inform and entertain fans of Cyril Davies and the development of blues harmonica in the UK. His name is often misspelled Cyril Davis. This page and all its contents, ©2013, all rights reserved.